Transportation Costs > How Much Does RV Detailing Cost? How Much Does RV Detailing Cost? RV detailing, just like car detailing, will make your RV look like new again. 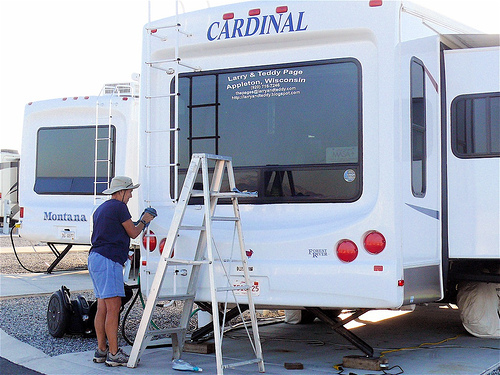 Whether it’s a simple wash and wax or a deep clean from the exterior to the interior, an experienced detailer will have the skills and knowledge to make your RV look as if it just rolled off the dealer’s lot. On average, most companies are going to charge by the foot, and depending on the size of the RV, the type of RV and the amount of cleaning needed, the costs of RV detailing can range anywhere from $3 for an exterior wash to more $20 per foot for an interior and exterior job. The more work that has to be done, just like car detailing, the more you will have to pay, so it can be hard to offer an exact estimate. Refer to our table below to see what a package may cost you. NOTE: A mobile service could be double, if not triple the costs mentioned above. South Central Storage, a detailer based in Pennslyvania, for instance, lists its prices on its official website. A basic exterior package starts at $3 per linear foot, while a full detail, including the interior and exterior, starts at $17 per linear foot. OrlandosDetailer.com offers three packages, with the pro RV detail package starting at $5 per foot, while the “Orlando’s Finest” starting at $20 per foot. Depending on what’s included in the detailer’s package, surcharges may apply for certain services. For example, buffing, compounding and sanding can be added to most packages for a few extra dollars per foot. Oxidation removal can be within the same price range as well. If any repairs were required, such as repairing the fiberglass and/or gel coat, then this could be an additional cost to budget for. A roof cleaning may or may not be included in the estimate. If not, this can be an additional charge to consider, often another $1 to $3 per foot. Scratch removal, if the detailer is able to remove it, can be removed for a small fee. Depending on the size of the scratch, this could be an additional $25 per scratch, on average. Slide outs on a fifth wheel, again, may or may not be included in the estimate. If it isn’t, this could be an additional $25 to $50 per slide out. Depending on the detailer’s policy, an RV in poor condition could lead to an additional surcharge. Detailers will always have a minimum charge, usually ranging anywhere from $50 to $300. Most detailers are often able to offer you an estimate over the phone or may include the quotes on their official website. Try to gather as many quotes as you can before settling on a provider, but don’t focus solely on the price. Be sure to look at reviews online and pictures of past work to ensure it’s a provider worth the price. We do select RV wax/sealant and charge between $10 to $20 a linear foot. A 40 foot motor home in good condition would be $10 X 40 X 2 = 80 total linear feet or $800. If the rear has no window then an additional $70. If the motor home is black or dark grey or any combination then it is an additional $5 to $10 per linear feet (total feet). If the motor home, RV etc, is chalky then the price doubles. Keep in mind that we also choose not to do many RVs because of lack of care and the customer will never be happy.